I'm heading to the SF Bay area tonight, returning Tuesday evening, so I won't be posting again until later next week. I decided not to bring the coat trim to work on during my trip. Just feeling lazy. I'm feeling like I'd rather be lost in books and magazines. In the meantime, I leave you with a photo of our dear Tilly. This past weekend when I was sitting at my sewing machine, Tilly wanted to sit in my lap. She put her front paws up on the chair, looking for a good place to jump, and I kept having to block her as I knew it would be difficult for me to work (and I'm sure you know how hard it is to say "no" to a kitty who wants some lap-time). As soon as I stood up to do some ironing, she took my chair! Have a good trip, Christina! Will you be able to visit Britex Fabrics? 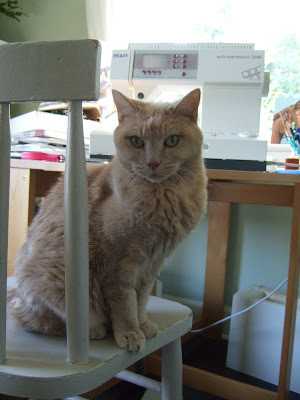 I had a cat who would sit on floor, looking up at me while I was sewing, and cry and cry until I would scoot forward, to the very edge of the chair. Then he would jump up behind me and curl up and go to sleep between me and the back of the chair. He passed away a few years ago - I still miss him. Give Tilly a kiss for me. Christina,I am making the same Burda Easy fashion coat and I cannot figure how to do the origami trim. I don't have the Burda WOF that has a coat with the same trim where it perhaps is described in English. I was wondering if you would indulge us into the technique for folding the trim?